Hansberry College Prep in Auburn Gresham will become the first public, charter school in Illinois to offer the International Baccalaureate program. 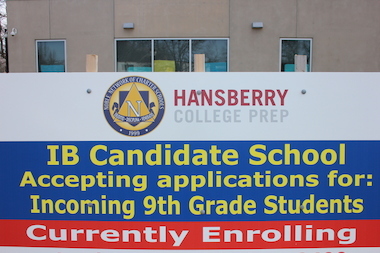 AUBURN GRESHAM — After a three-year effort, Hansberry College Prep will offer the International Baccalaureate program this fall, making it the first public charter school in the state to do so. Principal Lauryn Fullerton said she started the process of applying for International Baccalaureate status before the school, 8748 S. Aberdeen Ave., opened in 2012. "I started so early because I knew I wanted to offer my students the best possible curriculum available," Fullerton said Wednesday. She added that classes through the program are more rigorous than Advanced Placement courses because they are not limited to one subject, such as English or math. "IB courses are available for all classes, and that's a big boost for students preparing for college," Fullerton said. "The timing for us getting approval for the IB program is perfect. This fall we will have a junior class and next year we will have a senior class." Currently about "55 percent of students are already taking pre-IB courses," Fullerton said. Some 460 students attend Hansberry, which changed its name last year from Noble Auburn Gresham College Prep to honor the late Lorraine Hansberry, a Chicago native and writer best known for her play "A Raisin in the Sun." "Changing the name was our way our honoring this African-American writer," Fullerton said. In a statement, Drew Deutch, director of IB America, said the program's innovative approach to education would greatly benefit Hansberry students. “The fact that Hansberry has now successfully completed the authorization process and can soon offer IB, marks an exciting time for families and for the students who will benefit from an IB education," Deutch said. Fullerton is on a college tour with Hansberry students and credits the International Baccalaureate program at Lincoln Park High School, her alma mater, with helping her get into college.